Yesterday, I quickly took some pictures of my latest creations to show them. Unfortunately, I was a bit hasty (among other reasons because I didn't know how long the light would last) so I didn't iron the yellow skirt as well as I should have (note too self: the wardrobe is too full if skirts get wrinkled from hanging there...although it doesn't show in these pictures) and I didn't make an effort to coax my too long fringe into anything resembling a decent hair-do and I could have spend some more time trying to pull a nicer face when posing... Oh well, it's the clothes I wanted to show off. First up: a top and skirt. The skirt is a re-make of a mustard coloured pencil skirt I've made two years ago. The original skirt was the only casualty of the recent moth scare (a tiny hole at the hip. M said I could fix it but in this smooth fabric, I didn't think it would work. And I still had 3 meters of fabric left in my stash) and I have always been a bit self-conscious about just how snug it was at the hip. It work ride up when I walked and not fall down again on its own... Like all my skirts, it was based on a skirt sloper I made with M but it was the only one which really gave me this trouble. It guess it's down to the combination of a classic but somewhat demanding design and a mercyless fabric. Anyway, I made a second straight skirt sloper. 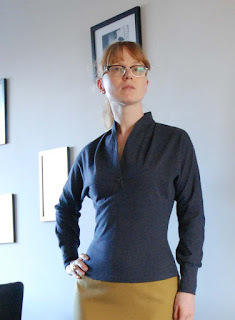 This one with a loosely taken hip measurement so the end result would skim my hips, rather than fit them firmly (I kept the old sloper as well, for something like cotton twill, that one is better). The sweater is very simple, it's my third time using this basic shape. 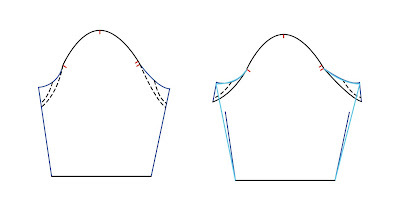 A simple, loose fitting, litterally T-shaped affair. 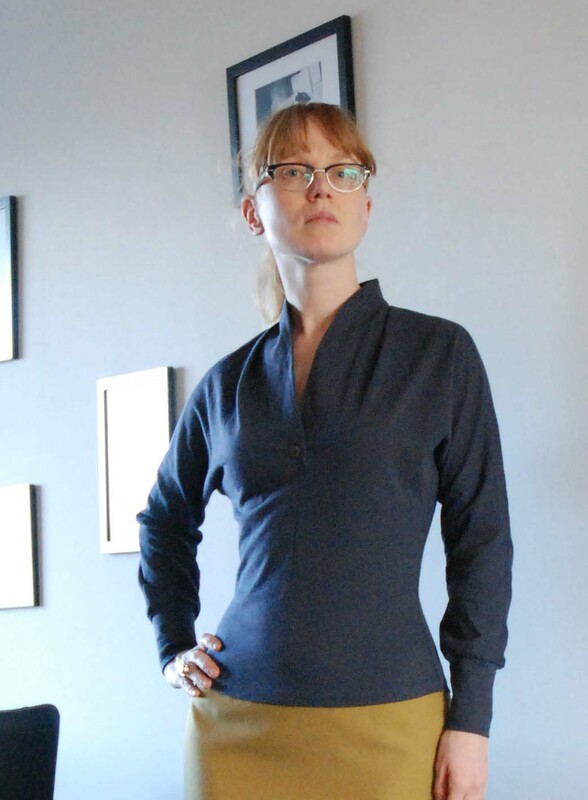 This one has a very simple straight neckline, with one tuck stitched down at center front. The sleeves are as long as I could make them and still cut front and back next to each other and I added long cuffs. 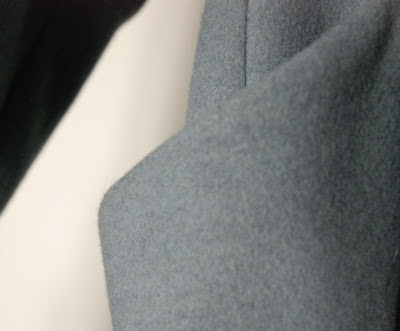 The fabric is a thin jersey with a fairly fine stripe. It thought it was black and white but on closer inspection, the dark stripes turned out to be dark blue. I bought 'what was left on the roll' very cheaply without knowing the fibre content but after wearing I believe this is wool jersey. Yes!! The stripes are a bit of a challenge. I spend a lot of time trying to cut the pieces so the stripes would match but it's a very shifty sort of material. Matching didn't work at the sideseams or at the seams of the cuffs. It did sort of work at those long shoulder/upper arm seams which are the most visible. So I'm happy with that. I like the vaguely 30's vibe of this top when it's worn tucked in like this. Then, still procrastinating while I could have been working on E's coat, I made another top. Here, I also used a tried and trusted shape, this one for the third time. Like on the previous one, I cut the back on the fold and made a center front seam. I changed the collar and the placement of the bust dart. Both earlier tops had a long bust dart coming up from the waistline, here I went for another 1950's favorite: a pleat at the neckline. It is usually used with either a cut-up collar (like I did here) or a shawl collar of some sort. I like how the top turned out but because of it's colour, a sort of grey-purple, I don't think it will become as much of a wardrobe staple as it predecessors. 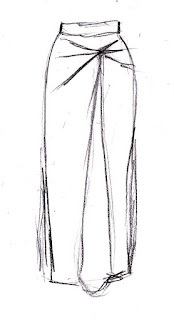 The design was one of a trio of show-y skirts I sketched at least a month ago. All of those could be made from stash fabrics, so I think you may get to see the others made up in new year. For this one I used some of the 4 meters of mystery fibre (I think wool and polyesther) bright purple crepe. This is the exact same colour and texture I used before for a dress and skirt but this fabric is slightly thinner. I used the new 'gently skimming the hips' skirt sloper and altered the front to include tight gathers at the front of the left hip and a wide godet which flares out below those. Of course, both skirts are lined and both are a bit longer than my skirts from previous years. I guess all that deliberation on skirt length got to me in the end... On a skirt like this, I really think you need the length, and the high waistline, to make the design work. This one is 75 cm from waist to hem. 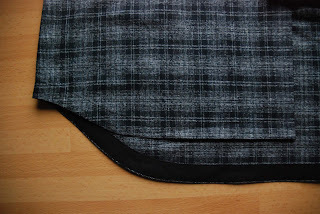 Now, I really have to get back to cutting the lining for E's coat. Hi everyone! I hope you've all had a good time over the Holidays. I've been putting off this post for a couple of days now. 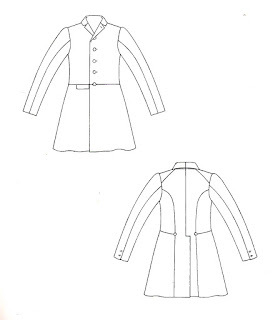 Basically, I have plenty to show you: I tweaked the coat design for E a bit more and am now ready to cut into the real fabric and I made two tops and a skirt, well actually, two skirts. However, the weather has been very uncooperative. It isn't cold at all but so very cloudy. All day, every day. I just haven't had enough light for half-way decent pictures. I'll show you all the good stuff as soon as possible, I promise. 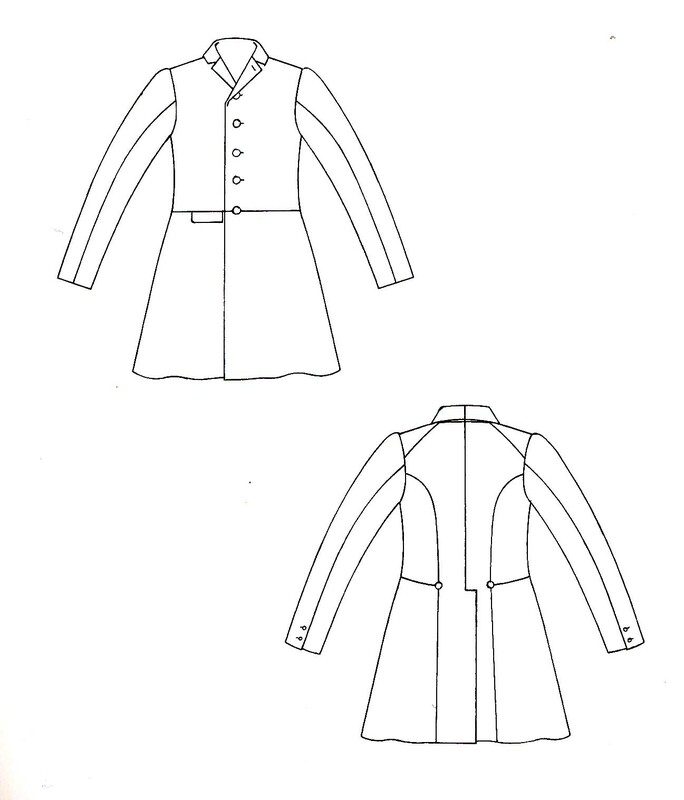 About the coat: I had to take it in at waist and hips a bit more and then I discovered a weird fit issue at the shoulder which hadn't bothered me before. 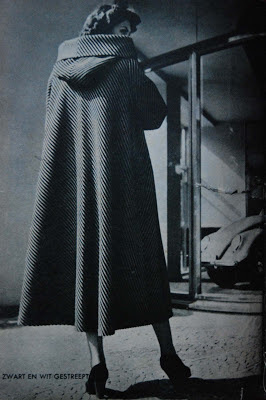 In the end, I think that was just proof of my ever more critical eye: the existing coat showed the same drag line from neck to armpit (which is often caused by a too tight back neckline and/or armscye, but not in this case). 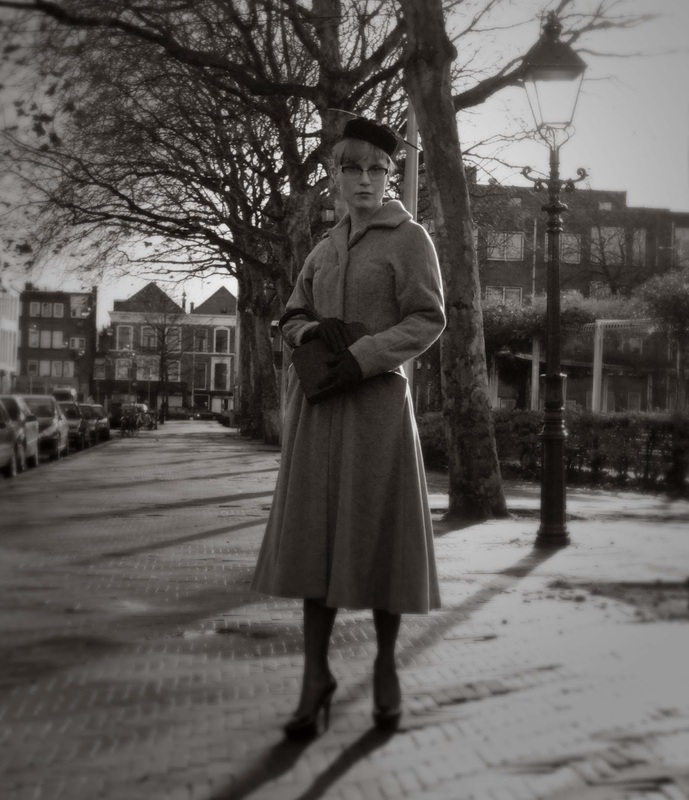 I finally tried a small shoulder pad and that solved all the remaining fit-issues: those drag lines, a slightly too tight chest area and the range of movement provided by the sleeves. I was really suprised to get that much result from so small and easy a fix. I guess that teaches me... Now, I will only have to do some minor surgery on the right pad to compensate for dear E's uneven shoulders. Not for me this time though. For the man in life. I made this coat for him in September 2010 and he has only worn it just about all the time in the two winters since then. I replaced the lining last spring but, apart from some hard to remove stains, it's still going strong. Nevertheless, I thought it was time to make him another one. Using the same fabric of which I still have a good 3 to 4 meters in stash. He said he would wear the old one to work and keep the new one as his 'good' coat. 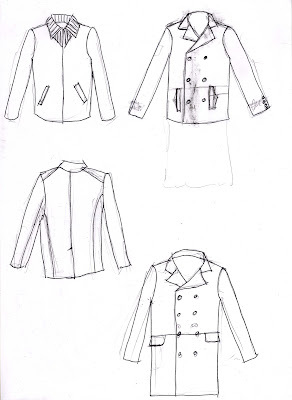 I started thinking about it last winter and I planned for something very similar in shape to the previous one, just with a rib-knit collar (the first sketch, top left). I just couldn't find an appropriately thick rib knit so I postponed until autumn. So, why not make something a little bit more classic, less casual. Like a double breasted coat, vaguely sailor-y (top right sketch)? 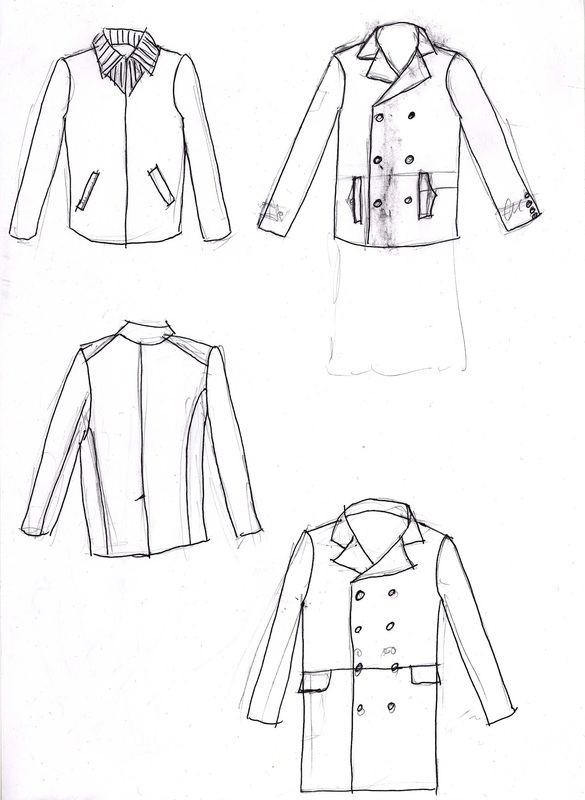 E sort of approved the sketch but wanted buttons at the sleeve. Like this example from the book 19th century fashion in detail. I planned to keep the basic shape I made before but incorporate the details I just mentioned. Of course, I was going to make a muslin for the bodice. When drafting that, I decided on a whim to make the whole thing 15 cm longer than before and to include a center back slit. E and I both liked the new length of the coat, to about mid-thigh. We didn't like just how straight and shapeless it looked. I then went one step further with the 19th century influence: A horizontal seam in the front and side panels (last sketch). 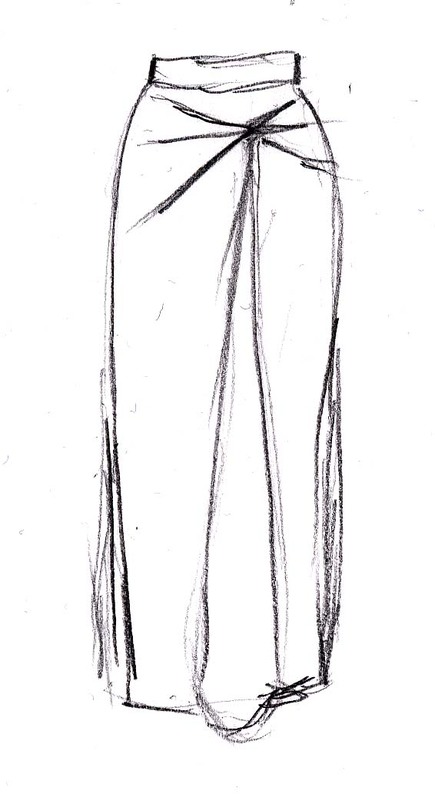 It will be ideal for making pockets and it allowed me to shape the waist a bit more without making it very obvious nor in any way (at least, I hope and think so) feminine. 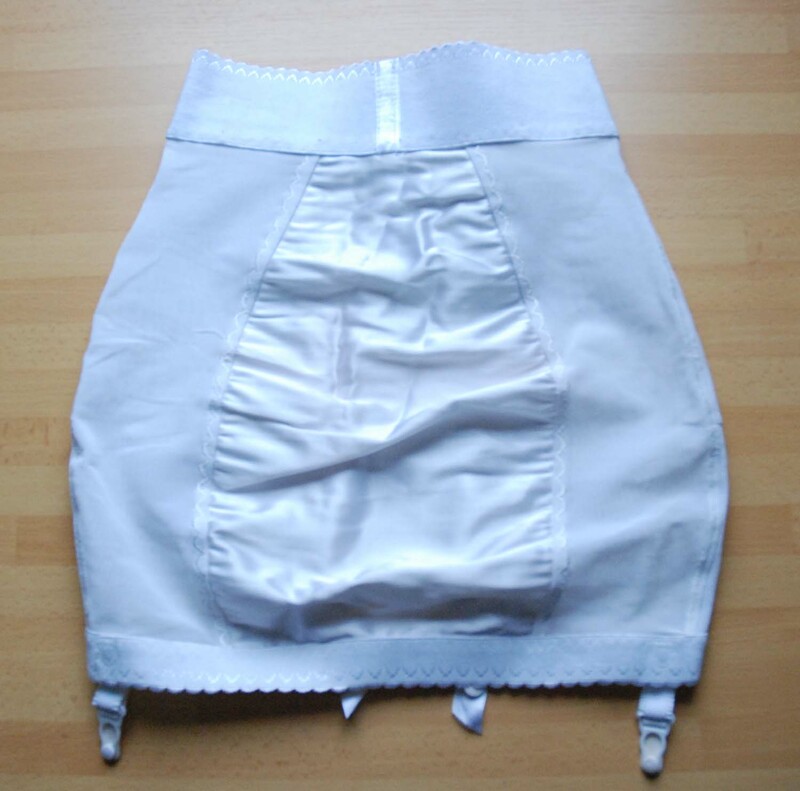 The front and side back 'skirt' are one piece which is ever so slightly flared. The upper pieces are seperate, so there is a sideseam there, which I took in 1.5 cm at the 'waist'line on each(sloping to nothing at the armscye). 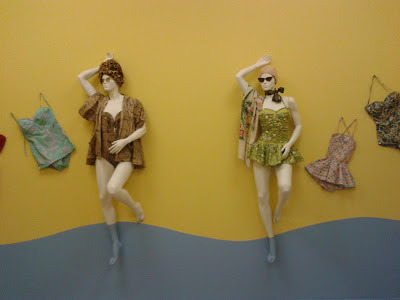 This week, I finally made my way to the Fabolous Fifties Fabulous Fashion exhibit at the Gemeentemuseum Den Haag. To be perfectly honest, I was a little bit disappointed with the (lack of) size and scope of the event. Sure, there were lots of nice things, but I'm pretty sure the museum has more and the choice the create themed rooms sort of blurred the developments during the era. 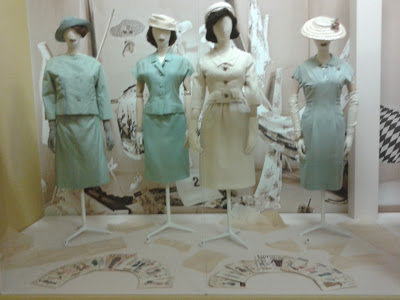 And although I loved the fact that they paid attention to the importance of home-made fashion and sewing patterns in the 1950's, I thought it was really odd to show only Vogue and Butterick envelopes. Instead of Marion and any number of Dutch ladies' mags, that is (I think some kind of endorsement deal may be behind this). That all said, I may well hyper-critical because this is an era of fashion history I know well, and love. What I wanted to talk about in this post is how well some garments in the exhibit tied in with things we, in the sewing blogoshere, all know and love. My apologies for the poor quality of the pictures, I didn't bring my camera and used my phone (the Gemeentemuseum allows you to take pictures, as long as you don't use either flash or a tripod). Of course, there were some designer favorites. 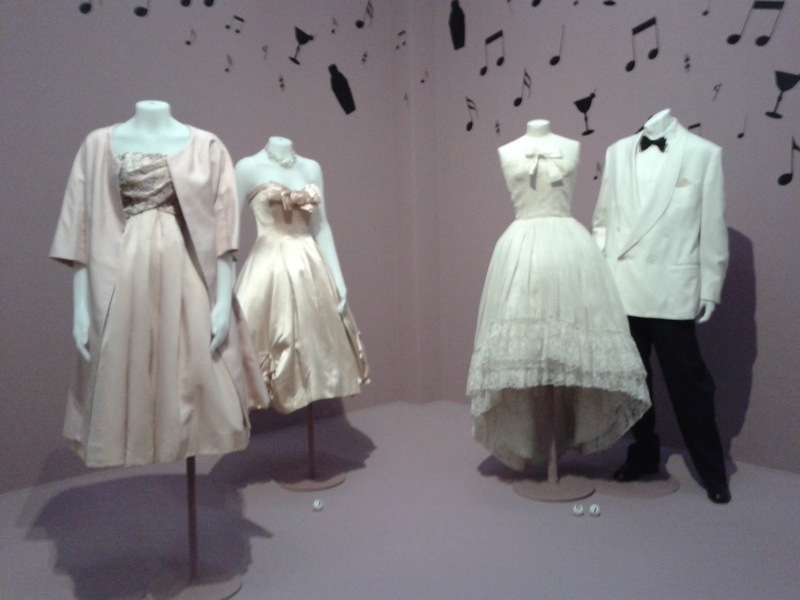 That satin one, second from the left, is a Dior, the tule an lace number right from it Balenciaga. But let's get on with the issue at hand. 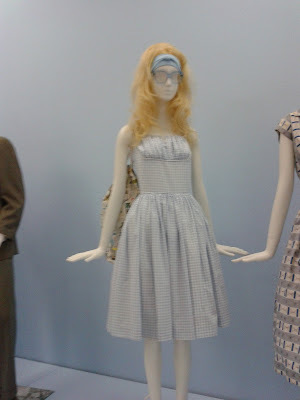 This dress reminded me of the Vintage Vogue 8728 (a reproduction) dress Erin was obsessed with about a year ago. It's not the same, but the two share some characteristics. 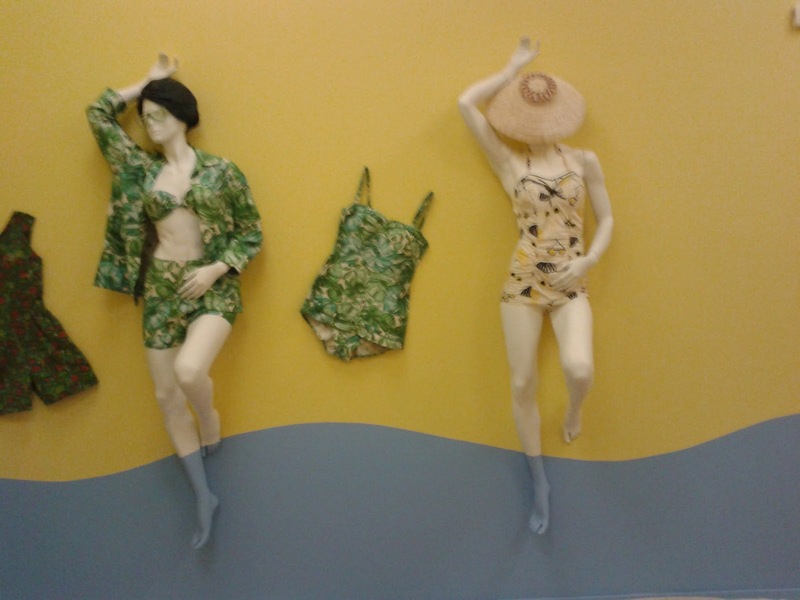 And who can look at a selection of vintage bathing suits without being reminded of Peter's quest to make one for his demanding model-cousin? 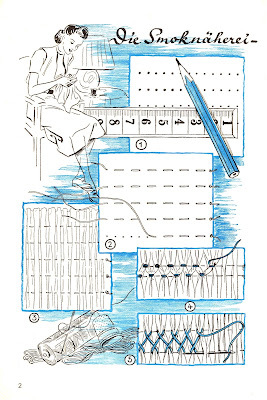 Here you can see what I told about attention given to sewing. In this room there were eight dresses, four in each window. Some were designer originals, some were copies made by licenced companies and some were home-made using designer patterns. And paper pattern stuff is used throughout as decoration. In this picture, from left to right, the first one is home-made, the second one is Givenchy and the third was made by a Dutch company which had bought a licence for this design. I don't remember who originally designed 1 or 3 or what 4 was. This dress was in the other window of the 'couture and home-sewing' room. Again, I don't recall the provenance of this particular garment, but its design must have started as a creation from some French designer. 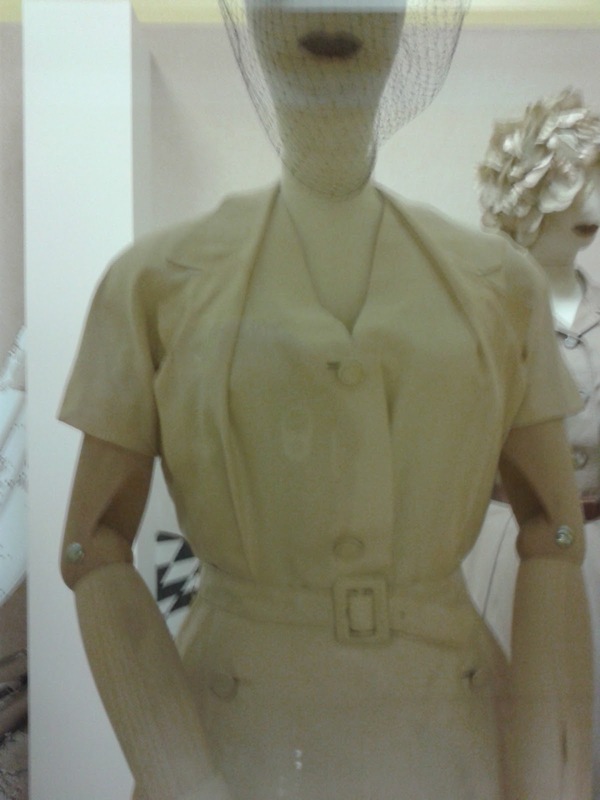 Just look at that bodice, those unusual... disappearing lapels. Who ever said Pattern Magic is always entirely original? I had a lot of fun with this little 'see and recognize' game, almost as much fun as I had collecting inspiration and thinking up myriad ways in which this exhibition could have been even better... I hope you enjoy it too! 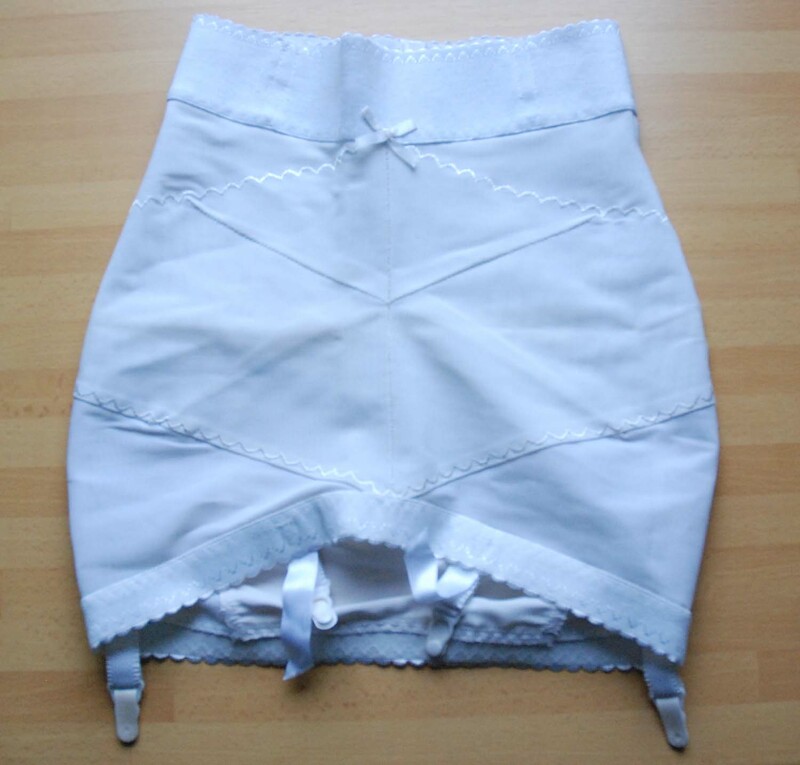 The Americans among you may not know this, but the contraptions worn to keep up classic stockings (those without sticky plastic at the top) you may know as "garter belts" are known to the English as "suspender belts". Cheap versions of these are often sold at big chain lingerie stores around Valentine's Day and, weirdly, Christmas. Those will typically have four plastic clips. If you're really interested in wearing stockings, you'll want a more serious version, with at least 6 straps and and metal clips (sold at places which specialize in stockings or vintage lingerie. I'm not showing pictures from these sites here because they are quite obviously showing women in lingerie and I don't want to offend anyone or get anyone into trouble where-ever they might be reading this blog). 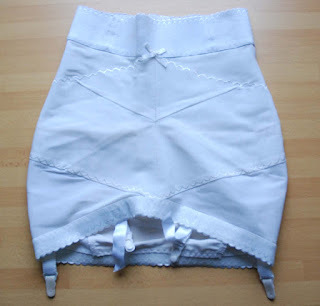 Or, probably even more in vintage style, you could try some kind of girdle (according to my vintage magazine research, suspender belts were mostly worn by teenage girls with grown-up ladies opting for girdles or full-length corsets). I've occasionally worn suspender belts and stockings under sufficiently wide and long skirts for a few years. In fact, when I threw out an old belt last year, I cut off the straps so I could make my own version. I just didn't get around to it yet. Also a while ago, I picked up this thing at the second hand market stall. I don't know how old it is, but it's definately a girdle. Wide elastic waistband boned in three places, powernet front and sides layered in some areas for extra compression, a non-stretch center back panel and four suspenders. I tried it on once... It sort of fits me but I nearly took the skin of my thighs to get into it and then made the foolish decision to try and take it off by pulling it up... 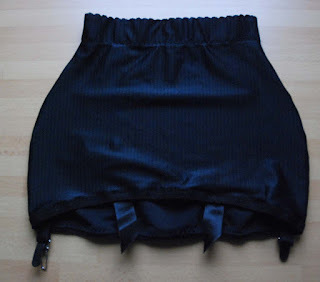 This may work for skirts with short zippers (if you're a bit pear-shaped like me) but this stretch material which only ever wants to pull in tighter... I don't quite remember how I finally managed to get it past my breasts and arms and shoulders but I know I considered cutting it up. And yet, girdles were worn for so long and are still sold at those vintage lingerie places. Surely there'll be some benefit to them? So, I made a 'light' girdle. The shaping at the sides is based on my lingerie bottom sloper, the length and placement of the straps on the vintage thing. I actually have some powernet but I decided to use lycra now (I don't actually feel the need to compress my hips anyway). The 4 cm wide waistband elastic is boned at center back and at two places on the front. I sewed the boning pieces to the inside and covered them with velvet ribbon. 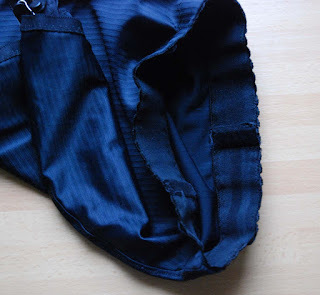 It's easier to put on than the vintage powernet girdle, but it's still a bit of a struggle. If I ever make a powernet version, it won't be a pull-on style like this. Once it's on, the girdle stays in place rather well and the elastic doesn't bend in on itself. Surprisingly, the four suspenders seem to do a good job at keeping stockings up. I think the fact that, with their very short straps, they can't move about helps a lot. As you may have noticed, I'm a pretty accomplished seamstress. Of course, that doesn't mean I can do everything, clothes-making wise. 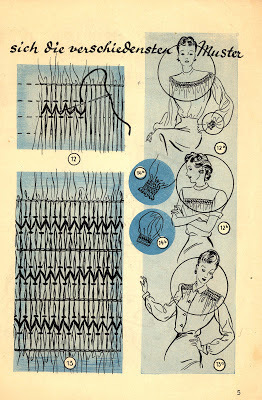 And I've just begun to learn something new: smocking. 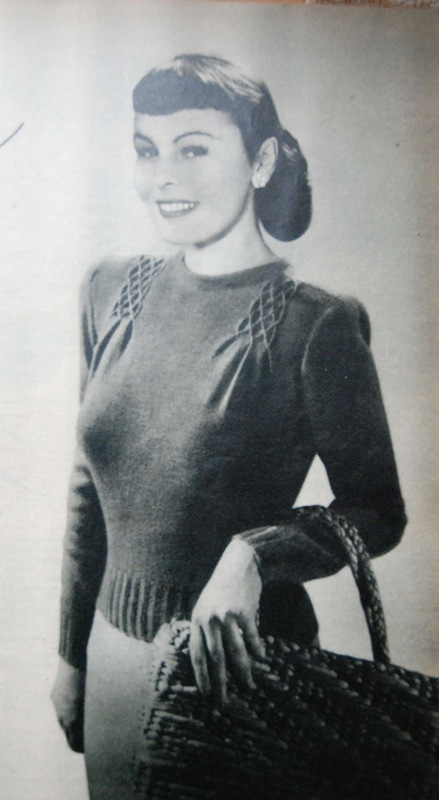 Some months ago, I brought wool and this pattern (from Margriet magazine from 1950) to my grandmother who had kindly volunteered to knit me another sweater (the first one was from a modern Phildar pattern). 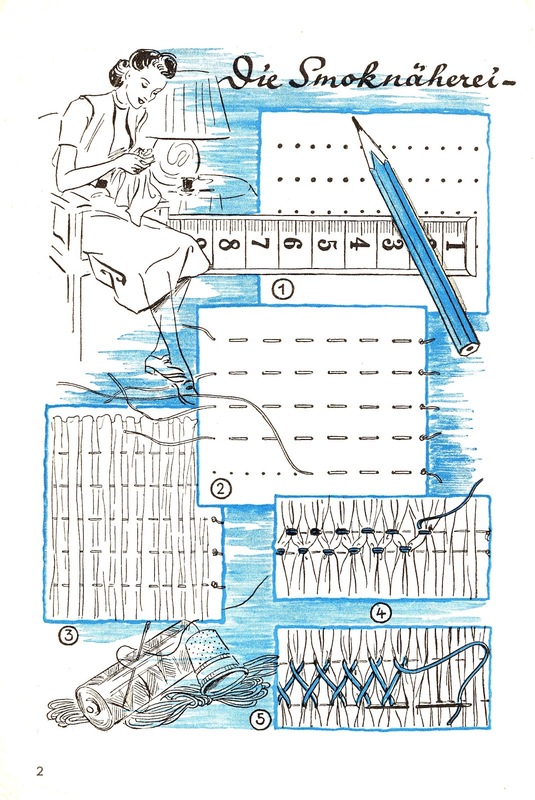 She found the pattern easy to follow and didn't mind the small gauge but she was worried about one thing: the page with the schematic drawing for those smocked bits was missing. She first gave the completed sweater front to my mother, who passed it on to me. I know it doesn't look quite the same as in the picture but, believe me, the amount of stitches and their spacing are right. To get this, I basted at every two stitches. I also tried basting at every three which made the smocking look more like the picture but took up a lot more space on the shoulder than it should. 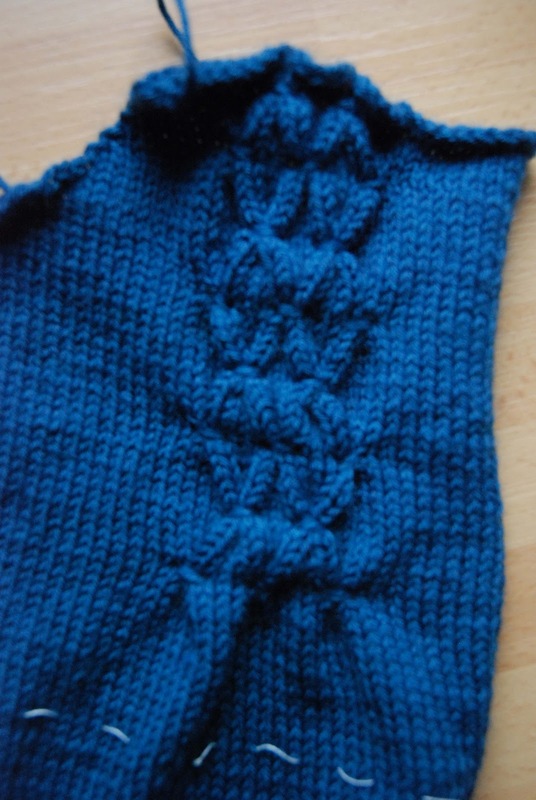 The way it is now, the width (both in resulting width and in amount of stitches used) and placement are about right. 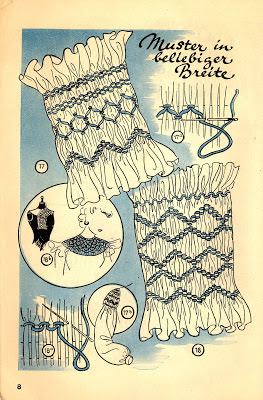 Once I got the hang of it, this basic smocking wasn't difficult at all. 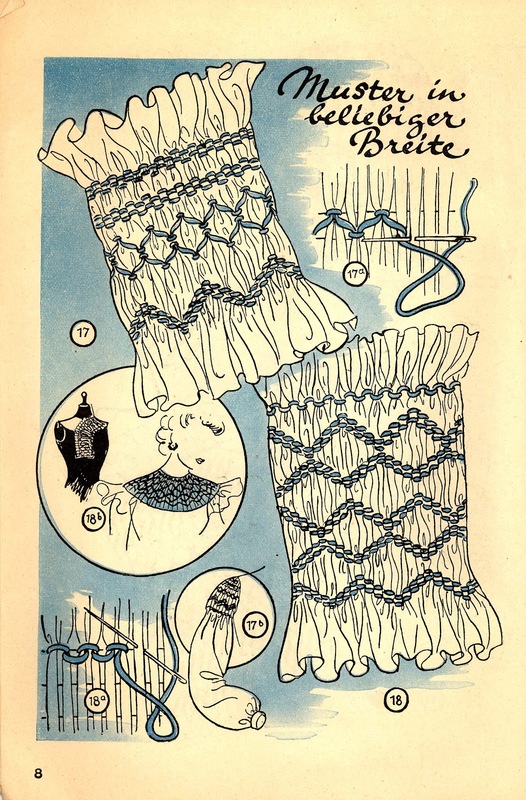 The booklet also contains a lot of information about decorative stitches and how and where you can use them. 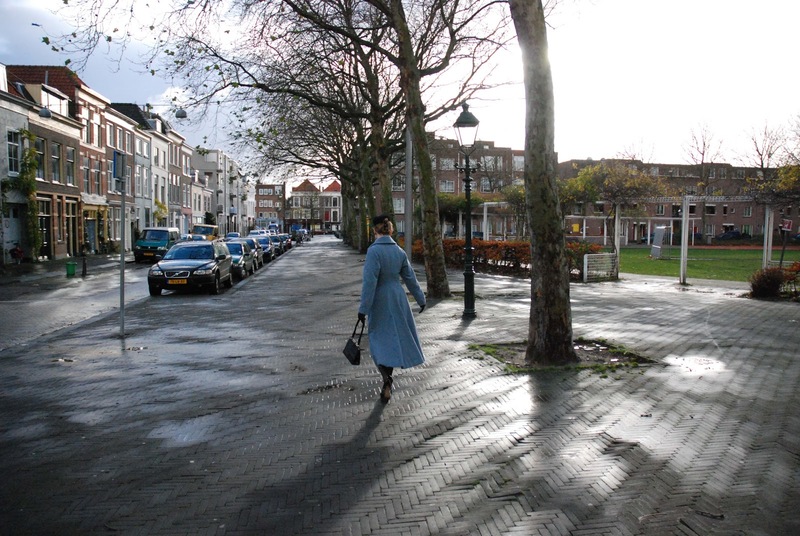 I saw this picture in my book of 1951 Beatrijs magazines and I thought this would be a great one to share with you. I should add that it's not typical for images in this publication. 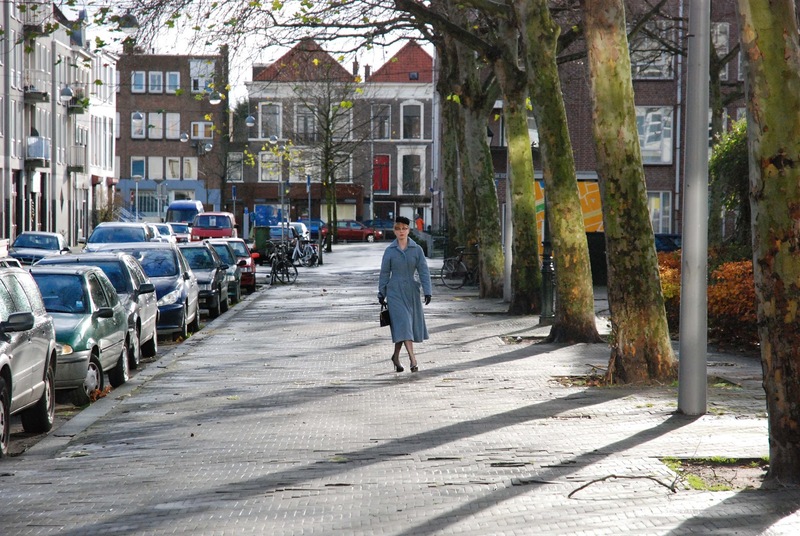 Beatrijs used its back cover for pictures (they did this in 1941, 1951 and 1954, so I guess it was a long-standing habit). These could be seasonal (little girls picking flowers), religious (a nun at a window, Beatrijs was a catholic magazine after all) or cute (small child with toy) but mostly, they were full page fashion pictures. 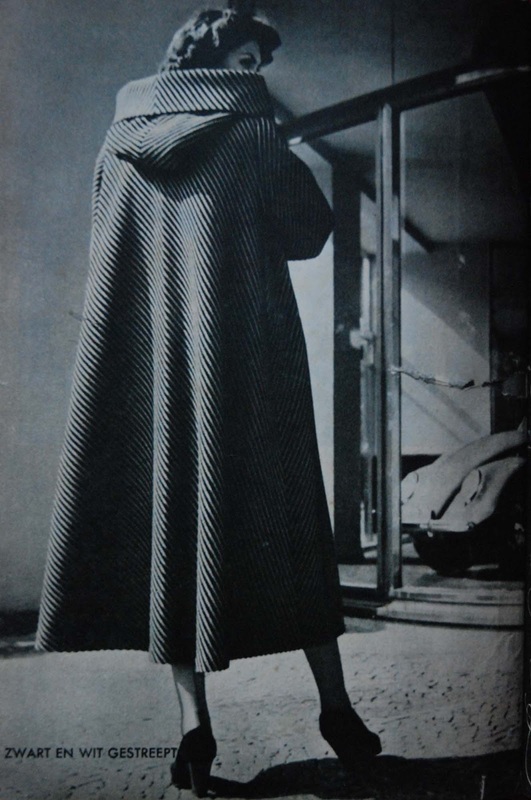 In the 1950's 'edgy' posing hadn't been invented yet. Models tended to be narrow waisted but healty women in their mid twenties who positioned their bodies in natural or elegant ways, depending on the type of garment they were wearing. They were always perfectly groomed and their poses seem designed to display the garment clearly and accurately. That is where this image is different. Bearing the simple title of "striped in black and white" is does show an elegant lady, wearing a diagonally striped swagger to perfection. 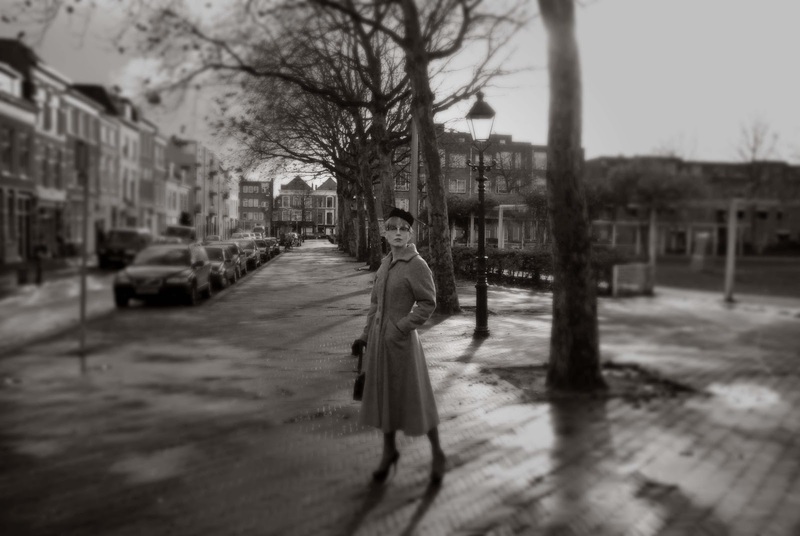 However, between the loose style of the coat and the stripes all you really see of the lady is a little bit of face and a pair of ankles in cuban heel stockings. This, in itself, gives the image an unusual, graphic quality but there is another unusual element as well. At the right side of the page, you can see (Oh, please ignore the weird line above it, that's a tear in the paper) the nose of a car. It's a little out of focus and yet, instantly recognizable, even today: it's a Volkswagen Beetle. The Beetle was (I learned from Wikipedia) first designed in the late 1930's but real production started after the Second World War, making it available in Europe in the late 1940's (although it wasn's sold in the UK until 1953). It owed its lasting popularity to its reliability and sturdiness but also to the iconic advertising campaigns made for it (mostly in the US) in the 1960's. I was aware of that last fact. To be honest, I was so well aware of the popularity of the Beetle in the 1960's that I wasn't even sure it could have been around in the early 1950's. That's why I looked it up in the first place. Thank you for all the nice comments on my coat! 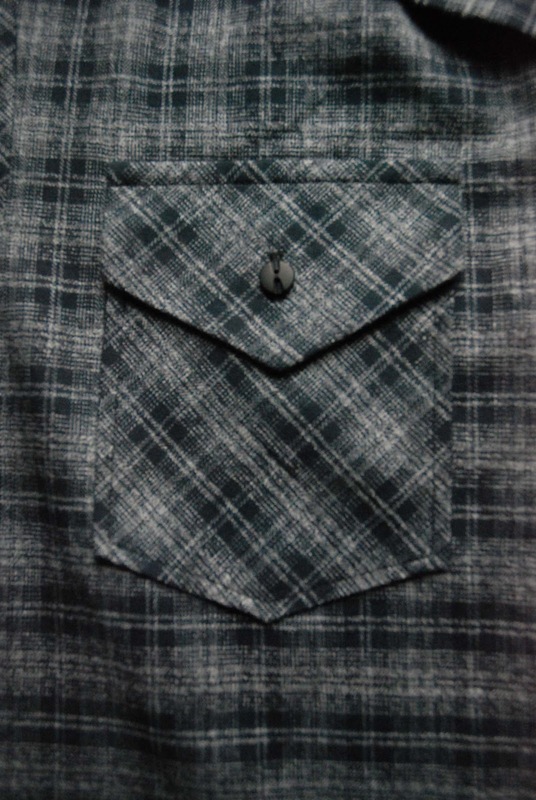 I always keep an eye out for fabrics which would work for fis clothes but menswear stuff is so much harder to find. And his taste isn't very adventurous. 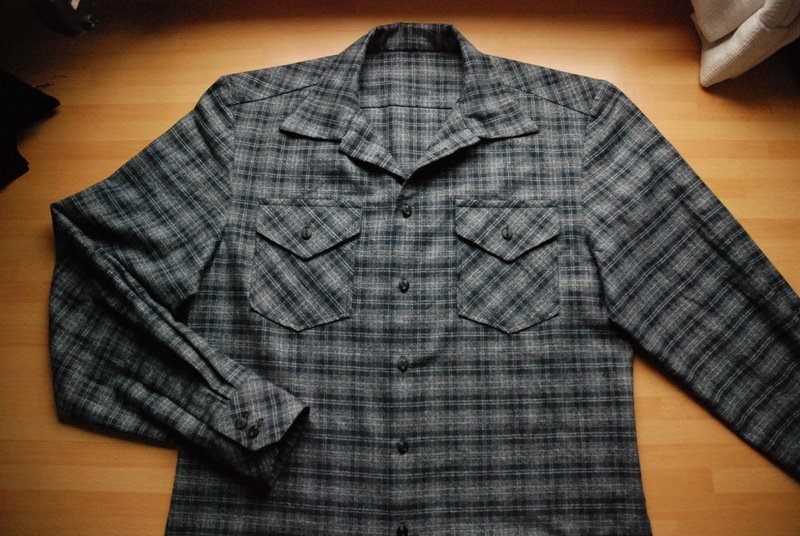 So, despite owning an overflowing stash, I immediately bought this cotton flannel when I found it at the market (could be a cotton polyesther blend, the burn test revealed a bit of synthetic in it). It's lovely and soft and has the right weight and hand for a winter shirt. They were selling several designs, so I may go back for more. The only, rather serious, drawback was the width of this fabric: 90 cm. I needed more than 3 m for this single shirt and I'm very good at cutting fabric economically. Luckily, I noticed this issue when buying and got 4 m. And the (lack of) width was reflected in the price. As usual, I used the shirt sloper I made for E years ago, using the "tailored shirt block" from Winifred Aldrich's Metric Pattern Cutting for Menswear. Like most times, I added a convertible collar instead of a classic collar and stand because E prefers it in wearing. And I completed the look with pockets with flaps. I chose not to make a contrast button band this time (so I had to be extra careful about matching the horizontals at the front). Of course, I played with the checks a bit. 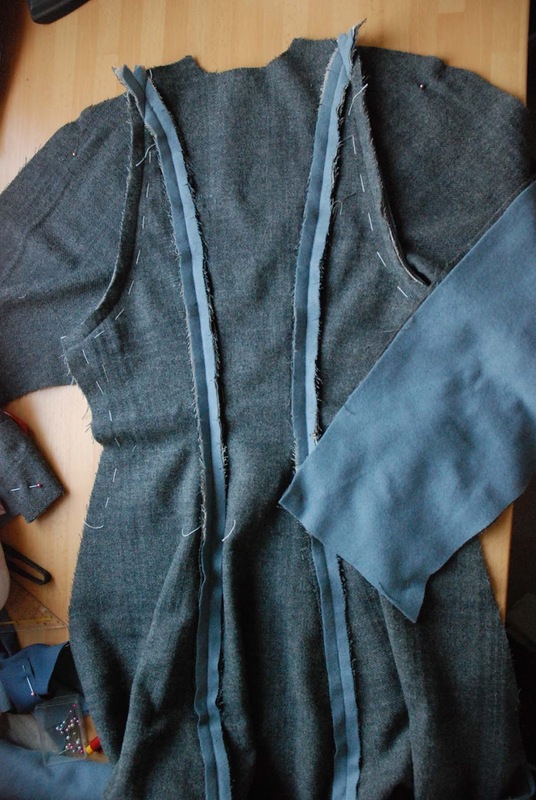 I took care with the placement of the back darts, matched the horizontal lines at side and underarm seams, at the sleeve plackets and, as mentioned before at the front. 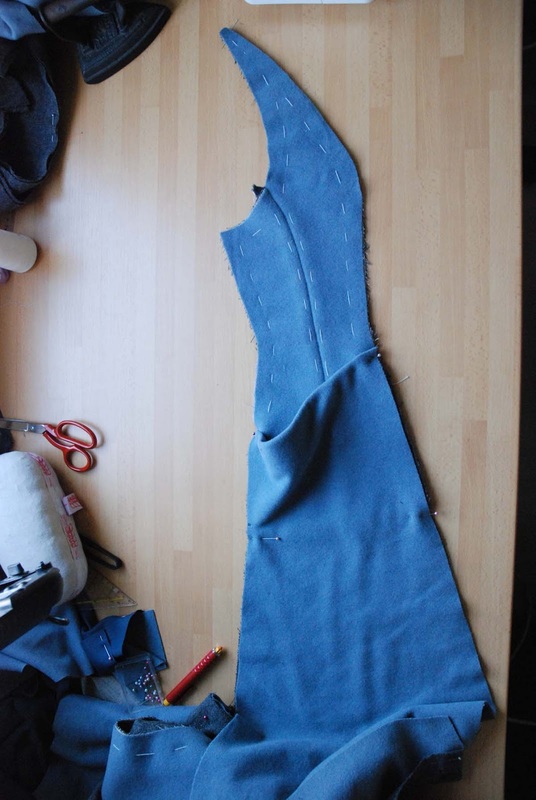 The back yoke, cuffs and pockets and flaps were cut on the bias. I stabilized the yoke by giving it an on-grain facing. 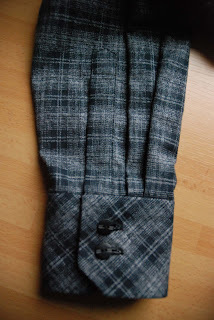 For the cuffs and flaps, I used fusible interfacing and on-grain facings. Only the pockets themselves at 'unsupported' bias cut bits but I took great care in pressing them in shape and sewing them on the (on-grain) shirt fronts. A little detail, because it may be helpful to some of you: I like the look of rounded shirt tail, but I don't like fiddling endlessly to hem them. And I don't like the badly twisting hems you often get on such shapes. 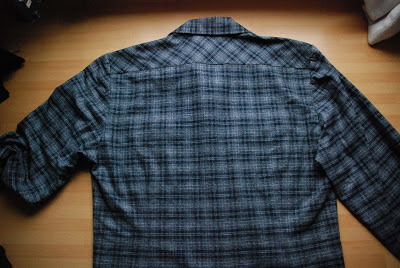 I often use this very simple cheat's trick: take (store bought) bias tape and sew along the bottom of the shirt (right sides together) in one of the folds, press to the inside of the shirt and topstitch along the edge. 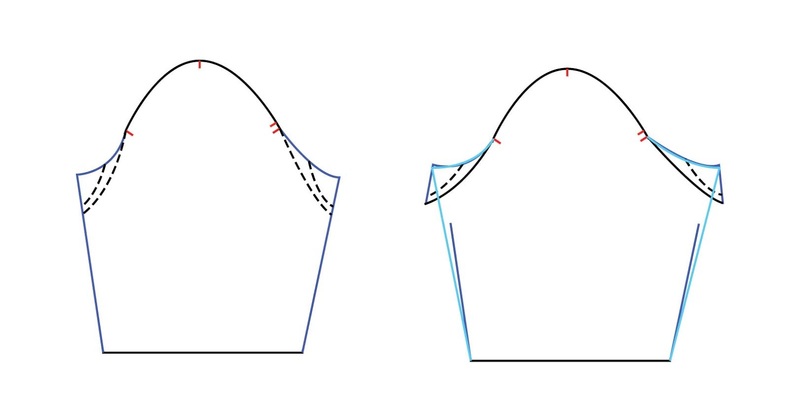 Et voila: an effortlessly curved hem. Here it is! We managed to make use a short sunny moment on an otherwise very rainy day to try and show off my new coat, my redingote. For this, I decided to go all the way: styling and make-up! 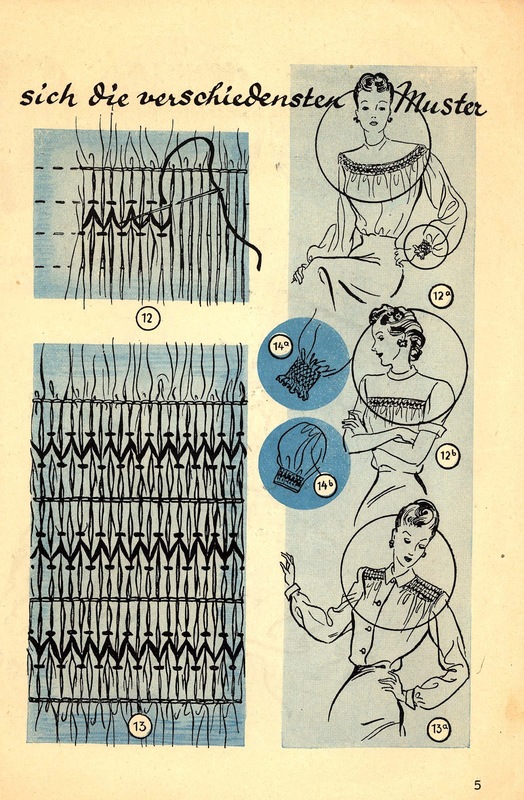 You may remember how it all started with this image in a 1953 issue of sewing magazine Marion. As discussed before, it has half raglan sleeves end on mid-shoulder where they meet the bodice princess seams. Those princess seams flare out from below the fitted wiastline to form a full skirt. On the side front pieces, there are stick-out pockets. The collar I finally decided upon creates the same high neckline as the shawl collar in the original design. 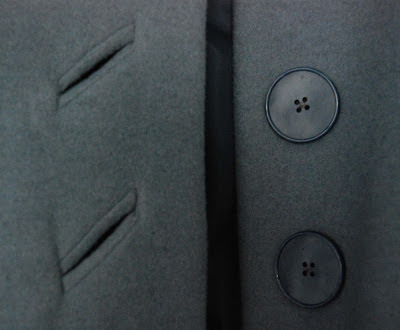 This allowed me to stick with the original button placement: One at the waistline, one below it and one at the collar. With diagonal bound buttonholes. It's short of a convertible collar (if I add a little button and loop, it could be worn closed) with four little darts at the back. The fabric is a blue-grey wool which has been in my stash for a while, underlined with grey wool, the bodice is interfaced with horsehair canvas and of course the whole thing is lined. And a dressy coat it is... I accesoirized with black for the photoshoot, mostly because it's the only colour in I have all pieces. The hat is vintage and was bought in London (at Portobello market, if I remember correctly), the gloves are vintage and from my local market and the purse comes from the same place but was very tired-looking and missing a strap so I did some DIY on it with bits of leather left over from one of my jacket projects. The shoes are the ones I often wear in pictures for the blog and were bought new. I certainly didn't plan to be absent from this place all week... But circumstances conspired against me. I finished the coat, of which I will only show you some close-up sneak peeks here. I plan on doing an actual outdoor photoshoot for it this weekend. At least, if E can be convinced to play along and take a couple of pictures for me. I spend the next day moth-proofing my stash and my wardrobe. Cedar chips, moth balls, the works... And my beloved jacket is now in the freezer. According to a book on vintage clothing, three days in there will kill any moth eggs which might be hiding. My recently acquired vintage silk dress underwent the same treatment. And from now on, any 'new to me' vintage find will! After all that unwanted excitement, I was quite happy to get away for a little bit and go with designer friend M to the fabric trade fair in Lille: Premier Tissu. We were looking for eco-fabrics for her brand but those were, unfortunately, not widely available. We did get a good insight into colour and fabric trends though. The 'it' thing for summer 2014? According to this fair, it's digitally printed fabric. Now, I really have to focus on two little 'assignments' first: making a dressy long sleeved knit top for my grandmother and replacing the waistband on a pair of trousers for my mother. The continuing story of the redingote: Sewing has occured! This is just a quick post to proove that I've actually started sewing. I was good enough, this time, to actually cut all the materials I needed before starting to sew (I often don't cut lining or evening interfacing bits until I need them). After all that cutting, I sandwiched the horsehair between the outer fabric and the underlining stuff and basted those sections, to keep it all in place. Fortunately, all the materials involved 'stick' to each other quite easily. I allowed myself to start on the easy, gratifying long seams instead of wrestling with diagonal bound buttonholes straight away. This is the back, with the back of the sleeves already sewn in (this picture comes closest to the real colour blue). This is the side front, with that stick-out pocket (of course I interfaced the pocket edge). I even had a good excuse not to start with those buttonholes: I wasn't that happy with the buttons I had originally picked out. The interesting dark mother-of-pearl button on the right can from my grandmother's button jar. I think it's a lovely button and I had the right amount of these. But... In theory a colour like this could be an interesting match with the greyish blue of the fabric but it never looked quite right to me. The buttons were also a bit small. 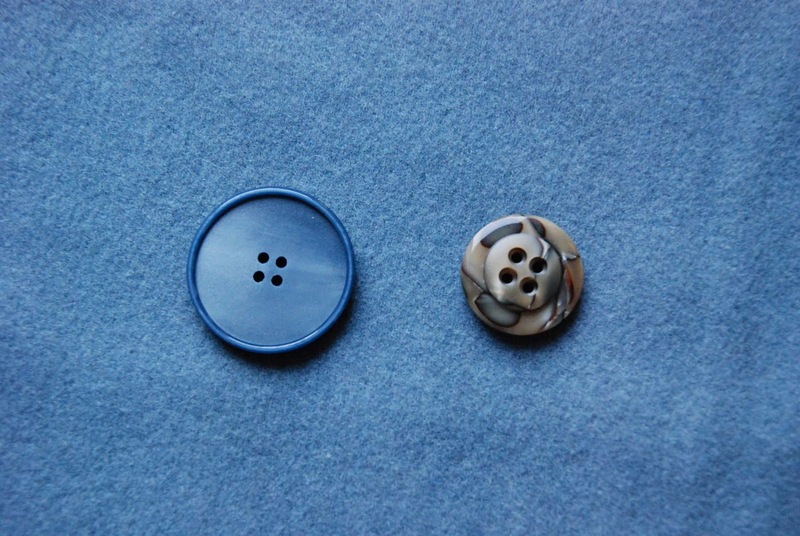 At close to 3 cm in diameter, they aren't exactly small but I wanted to stick with the look of the buttons in the Marion design, which calls for three 4 cm buttons. So, this afternoon, I went to the fabric store (I already looked for buttons at the market and didn't find anything) and bought the blue ones on the left. Now, these are buttons for this coat!